Before we get to the information in this column, allow me to make a few disclaimers. Officials in any sport are human. They can make mistakes and often do. It is unfortunate, but that is reality and since we are all human, there should be some level of understanding of this when there are bad decisions made in a game by officials. 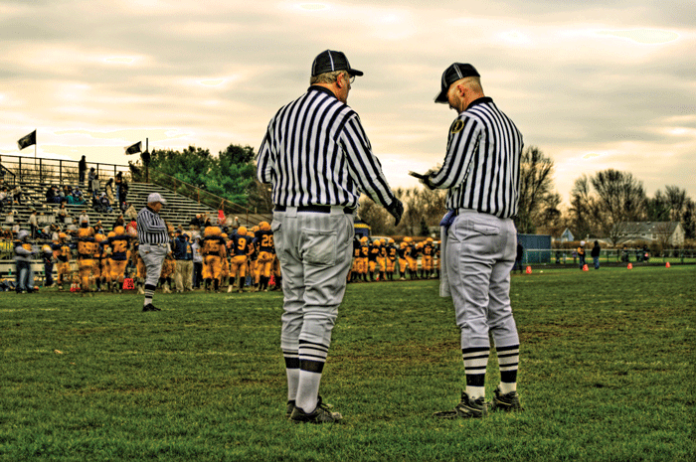 Another issue in today’s high school sports arena is a critical shortage of officials to call the games at the high school and junior high level. Why is this? We will discuss some of those reasons further in this column. One other disclaimer – I would never want to be an official. I will admit, however, to expressing frustration as a fan when officials make a bad call. However, when there are repeated mistakes that are relatively obvious in a game, it is fair to bring those issues to light. Last Thursday night at Ryan, I witnessed what was one of the poorest officiated games I have ever seen. I have been to a few in my 61 years – about 500 games. Most of the time fans complain of the officiating when their team loses, but this time Ryan rallied for a last-second 78-74 win over Bray-Doyle. The discrepancy in the number of penalties against each team in this game was mind-boggling. Ryan was flagged 24 times (not counting one penalty on an extra-point try), while Bray was whistled for only six penalties. To be perfectly clear, Ryan was guilty of many of those penalties and must find a way to have more discipline during a game if they are to close out the current season with success. Most of the critical calls came in the second half when the game became close. Two pass interference calls, which are some of the most difficult to make in football, went against Ryan. One the Bray-Doyle receiver clearly pushed off the Ryan defender, but interference was flagged against Ryan. The second missed call was actually a no-call as a Ryan receiver was streaking down the right sideline and was bumped by a Bray-Doyle defender keeping the Ryan receiver from reaching the ball. Probably the worst call of the night came when Ryan coach Tony Tomberlin was giving a defensive signal. The referee blew his whistle and signaled timeout. The Ryan players and coaching staff were bewildered and when discovering none of the players called timeout, the referee was asked who called the timeout. The referee informed Coach Tomberlin that he called it and when an explanation was given the referee refused to rescind the timeout. In my opinion, that was an easy fix. Simply call the teams back to the field and resume play. Late in the game when Ryan was trying to drive for a clinching score and run out the clock, a Ryan player lost the ball after being tackled. The film is a bit inconclusive, but it appeared he was down before the fumble, but the officials gave the ball to Bray-Doyle and the Donkeys eventually scored the go-ahead touchdown with 43 seconds to play in the game. One other call in the fourth quarter that impacted the game was a targeting penalty called against Ryan’s Skylar Parkhill that results in an automatic ejection. 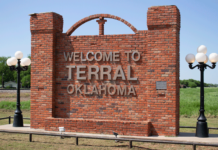 The film was sent to the Oklahoma Secondary Schools Activities Association. It was ruled not to be targeting and the ejection was rescinded so Parkhill will be eligible to play in Ryan’s contest with Wilson tomorrow night. A few other calls were certainly questionable throughout the game. This officiating crew must have had an off night. They are regarded as one of the best crews in this area and are usually found officiating at larger schools on a weekly basis. One of the real issues with officiating in all sports is the lack of numbers of officials in Oklahoma. As current officials are growing older and eventually hanging up their whistle, younger people are not stepping in to take on the job. The shortage is real. Just a quick scan of the internet produced articles from Muskogee and Lawton that have been written in the past couple of years about the shortage of officials. Games have even had to be rescheduled to a different night because officials could not be found to work a particular game. Now in defense of the people that are not stepping up, it is a greater challenge to officiate games of all sports because kids are bigger and faster than they used to be. In football and basketball in particular the game is faster than ever before. Many times people are not joining the officiating ranks because they do not want to put up with coaches and fans that at times can be irate and irrational. The abuse they some times take is often excessive. And some sports such as basketball and baseball, the officials are not far from the fans. And there are a growing number of student-athletes that come with less than the best attitudes and when a call doesn’t go their way, the attitude of the player comes out. This is often detrimental as officials that are human take notice of this and often begin to look at that player a bit unfairly or with more scrutiny. Players, coaches and fans need to be held accountable for some of the problems with the shortage of available officials. But, the need for officials is real. Local organizations in Lawton, Duncan and Ardmore are actively searching for new people to join the ranks to call games in baseball, softball, soccer, wrestling, football and basketball. If you are interested in becoming an official, go to the Oklahoma Secondary Schools Activities Association’s website (ossaa.com) and register. There is a fee and there is a lot of preparation involved to eventually become an official. The pay level is not great, but if someone needs a little extra cash, you can make up to $1,000 a season and if you can call more than one sport, the figure will increase. So if you can weather the criticism and you want to be involved at some level with young men and women, you are urged to take the appropriate steps and become an official. More numbers usually results in a higher quality of product and it is no different with officials. The need is real and the issues are real, but they can be solved. LAWTON – After finishing second in two straight meets, the Waurika boys’ cross country squad surged to the title at the Cameron University Invitational here last Friday. 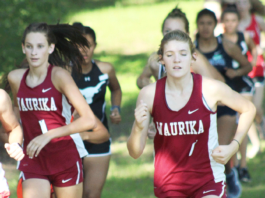 The Waurika girls’ squad also ran impressively with a second-place finish to Ryan bolstered by the first and second place finishes of Asia Smith and Lexie Streeter, respectively. Both teams will travel to Velma-Alma for Saturday’s Class 2A Regional Cross Country meet at the Wildhorse Golf Course at Velma. The Lady Eagles are pitted with six other top 15 teams at the V-A regional. Waurika is ranked 12th in Class 2A. The Waurika boys are unranked, but come with some momentum after the win last weekend and two straight runner-up finishes. Four top 15 teams will be competing on the boys’ side of the regional. Cache Arellano crosses the finish line in fourth place for Waurika at the Cameron University Cross Country Invitational last Friday at Lawton’s Big Green Soccer facility. Waurika will be trying to qualify for next week’s state meet which will require the squads to finish in the top seven of the teams. The top 10 competitors not on a team that qualifies for state will also be tabbed to compete in the state meet. Last Friday the Lady Eagles were second to Ryan in the team competition. Ryan had 26 points and Waurika finished with 35 points. Smith recorded a time of 13:12.86 in taking the girls’ title, while Streeter was not far behind with a time of 13:20.80. Asia Smith crosses the finish line in first place at the Cameron University Cross Country Invitational in Lawton last Friday. Tallin Mora also earned a medal for the Lady Eagles with her 10th-place finish. She recorded a time of 14:09.52. Faith Roberson was 19th on the day with a time of 15:24.23, while Dallas Fristoe was right behind in 20th place with a time of 15:37.02. Rounding out the competitors for the Lady Eagles were Kaci Reynolds (22nd, 15:37.02), Hope Cummings (31st, 16:56.97), Gracie Walling (39th, 17:53.48), Madison Roberson (43rd, 18:25.86) and Sara Ballard (48th, 20:49.57). The Eagle squad claimed the title by nudging out Purcell. Waurika finished with 42 points, while Purcell tallied 45 points. 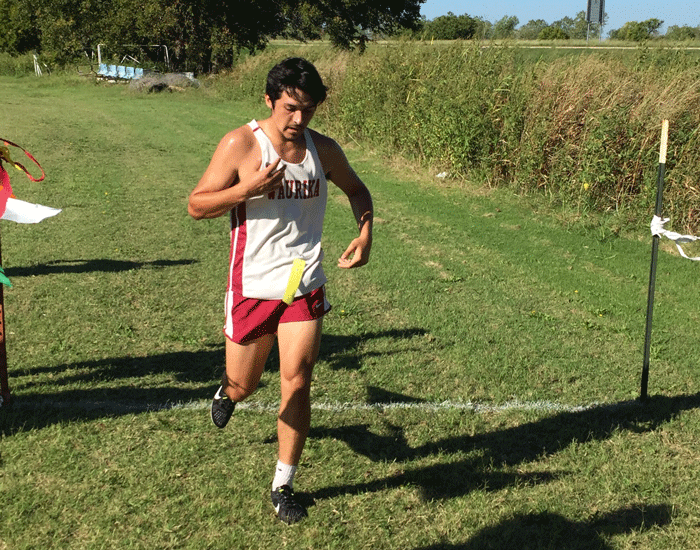 Bryson Hernandez led the finishers among the Waurika boys’ competitors just as he has in all but one meet this season. Hernandez crossed the finish line in third place with a time of 19:44.50. Bryson Hernandez finishes the 5K high school boys race at the Cameron University Cross Country Invitational at Lawton last Friday. Pictured behind Hernandez is Cache Arellano. The two runners finished third and fourth, respectively, in leading the Eagles to the team title. Teammate Cache Arellano was right behind in fourth place with a time of 19:45.96. Arellano and Hernandez were the only two medalists for the Eagles. Gustavo Gomez was 13th in the race with a time of 21:38.53, while Octavio Gomez was 16th with a time of 21:21.09. Travis Etheridge rounded out the harriers for Waurika by finishing 29th with a time of 24:14.81. LAWTON – Coach Steve Spangler and the members of the Ryan Cowgirl cross country squad set some goals before the season started. One of the goals was to win five meets during the cross country season. Last Friday, the Cowgirls met that goal as they claimed the title of the Cameron University Cross Country Invitational II here. 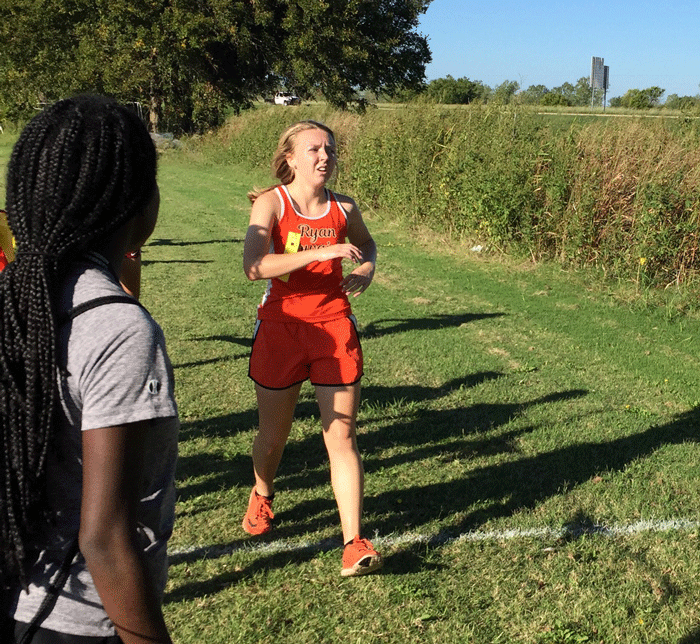 Lily York crosses the finish line at the recent Cameron University Cross Country Invitational and earned a medal with a ninth place finish for the Cowboys last Friday. Unlike most courses, the Lawton course was fairly wide open and a strong south wind made the event a little tougher even though only four teams competed for the team title. The Cowgirls claimed the first-place trophy with 26 points, edging out Waurika who finished with 35 points. Lone Grove was third with 83 points and Lawton High finished fourth with 85 points. This was the final meet of the regular season as the Cowgirl squad will compete in the Class 2A Regional Cross Country meet on Saturday at Velma-Alma’s Wildhorse Golf Course. Julie Spangler edges out a competitor from Lone Grove to finish seventh in the Cameron University Cross Country Invitational at Lawton last Friday. The fourth-ranked Cowgirls will be joined by top-ranked Watonga in the Velma regional, which is somewhat surprising considering Velma is over twice as far from Watonga as the northwest regional to be held in Enid. The top seven teams will advance to the Class 2A State Cross Country meet at Shawnee a week from Saturday. Lilybet Harmon crosses the finish line in third place last Friday at the Cameron University Cross Country Invitational in Lawton. The Cowgirls will not only have the top-ranked squad to face, but will have five other teams that are ranked in the top 15 in the state in the Velma-Alma regional including the hosts, Waurika and Merritt. 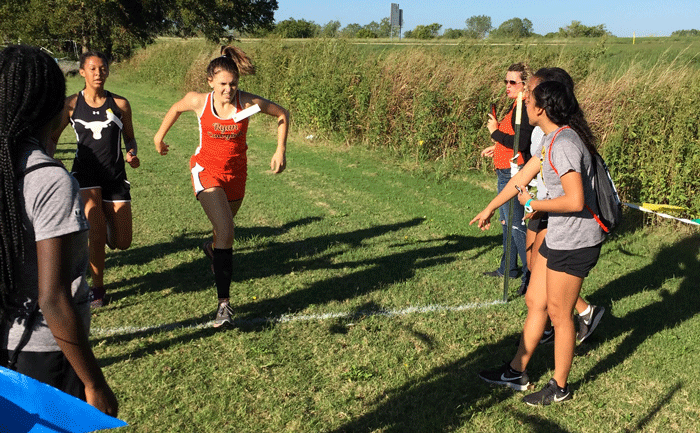 For the second meet in a row, Lilybet Harmon led the contingent of Cowgirl harriers with a third-place finish at the Cameron meet. Her time of 13:35.20 was the best of the season in the 3,200-meter distance. 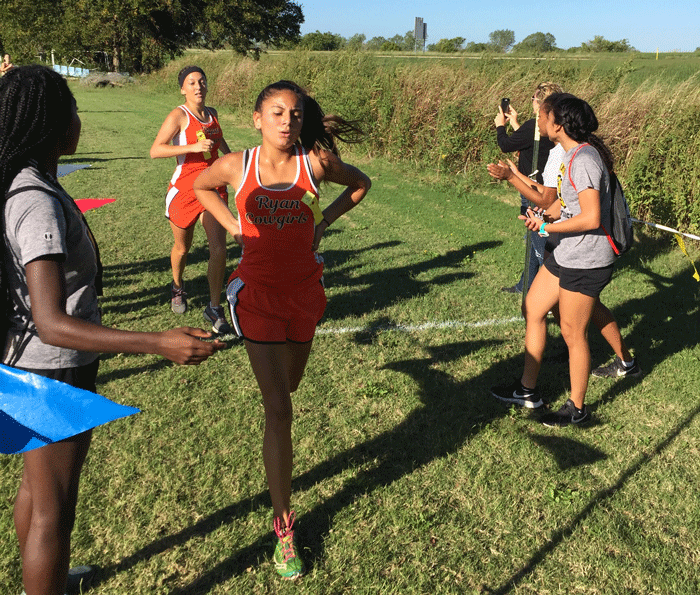 Katelynn Dabbs (front) and Holland Carter are (back) shown finishing the Cameron University Cross Country Invitational meet in Lawton last Friday. Dabbs finished fifth and Carter was sixth in the race. Katlynn Dabbs was fifth for the Cowgirls and finished with a time of 13:54.40 – also her best time of the season. Holland Carter was just a half a second behind Dabbs and finished sixth with a time of 13:54.92. But, it was also Carter’s best time of the year. Juliet Spangler, who was battling a nagging minor injury, finished seventh in the race with a time of 13:59.27. CAMERON CHAMPS – Pictured are members of the Ryan Cowgirl cross country squad that claimed the title of the Cameron University Cross Country Invitational last Friday in Lawton. Pictured are (left to right) Juliet Spangler, Lily York, Holland Carter, Katelynn Dabbs, Lilybet Harmon and Alicen Williams. Lily York rounded out the medal winners for the Cowgirls with a ninth-place finish and a time of 14:07.92, which was also her personal best in 2018. Alicen Williams finished 23rd in the race, but also posted her best time of the season at 15:43.68. It was a remarkable night at Bob Givens Sports Complex last Friday night as the Ryan Cowboys rolled to an 84-38 victory over District B-4 foe Empire. Scoring 84 points in a game is quite a feat, but it is incredible when you discover Ryan scored all 84 points in the final three quarters of play. 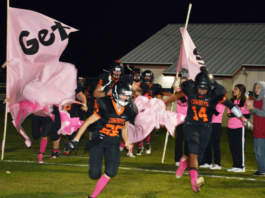 The Cowboys will try to maintain the momentum gained with the victory over the Bulldogs when they make the short drive up Highway 81 to battle Waurika tomorrow night (Friday). Kickoff at Cy Sloan Stadium is set for 7:30 p.m. Both Waurika and Ryan enter the contest with a 1-0 mark in district play. Waurika is 5-0 overall, while Ryan is 4-2. Last Friday’s first quarter was defined by two long drives by both Empire and Ryan that resulted in no scoring. Ryan drove to the Empire 15 after getting an interception by Kalen Weldon on the first series of the game, but turned the ball over on downs. Empire took over and took 16 plays to go from the Empire 19 to the Ryan 19, but on the next two plays the Ryan defense came up big and handed the Bulldogs losses of nine and two yards to turn the ball back to the Cowboys on downs late in the first quarter. This gave the Cowboys their worst field position of the night at the Ryan 30, but the Cowboys methodically took the ball and drove the 70 yards for a score. Skylar Parkhill ran the final nine yards for the score and Dallas Fristoe ran for the two points to give Ryan an 8-0 lead with 7:50 to play in the second quarter. On the ensuing kickoff the Cowboys perfectly executed a pooch kick and Weldon pounced on the ball before Empire could field it to put the Cowboys back in business. The Cowboys took quick advantage of the Bulldog miscue and drove 38 yards in just three plays. 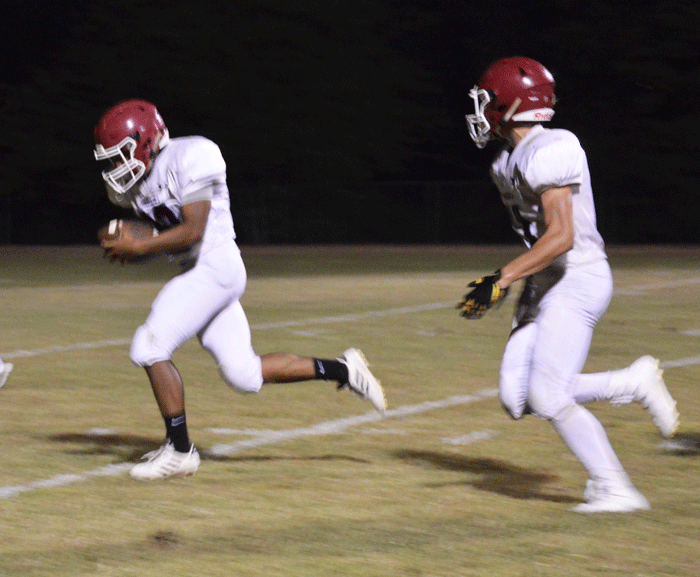 Parkhill rushed for all 38 yards – the final carry covering five yards for the score. Parkhill ran for the two points and quickly Ryan was up, 16-0, with 7:06 left in the half. Empire took possession at its own 48 yard line after an onside kick attempt and this time the Bulldogs answered with a scoring drive of 52 yards on eight plays. Peyton Booth ran the final 20 yards for the score and quarterback Mitchell Monteith ran for the two-point conversion to cut the Ryan lead in half at 16-8 with 4:46 left to play. Possibly the play of the game for the Cowboys came on the ensuing kickoff when Travis Fristoe took the ball in the middle of the field at the Ryan 35 and maneuvered his way through a wall of tacklers and finally cut out to the left side for a clear path to the end zone. Parkhill ran for the two points and Ryan had a 24-8 lead with 4:40 left in the half. The Bulldogs had an answer, however, as Empire took possession at its own 41-yard line following another short kickoff. Two straight running plays produced first downs and then Monteith found Mcray Weber wide open for a 37-yard touchdown pass. The run failed, but the Ryan lead was cut to 24-14 with 3:36 left in the half. The Cowboys were not through scoring, however – not by a long shot as it turned out. Ryan took the ball at the Empire 46 after another onside kickoff attempt and promptly drove 46 yards on seven plays for a touchdown. Grayson Tomberlin ran up the middle from the one-yard line for the score and then passed to Weldon for the two points to give Ryan a 32-14 advantage with just 16 seconds before the break. As the third quarter got under way it looked like Ryan would take command as they drove 47 yards in four plays for a score. Parkhill got his third rushing touchdown of the night as he scampered 16 yards for the score. Parkhill ran for the two-point conversion and Ryan held a 40-14 lead with 10:33 left in the third quarter. Empire, however, answered with a seven-play, 53-yard drive with much of the work being done by Booth. He got the score on a three-yard run and Booth also ran for the two points to cut the Ryan lead to 40-22 with 8:10 left in the third quarter. The two squads then exchanged fumbles. Weldon raced to recover the snap over the quarterback’s head and this gave Ryan another short field at the Empire 33 yard line. On the first play, Parkhill raced 33 yards for the score and then Tomberlin found Fristoe on a two-point pass completion to put Ryan in front, 48-22, with 7:37 left in the third quarter. Once again Empire proved its ability to score as they took the ensuing kickoff from the Empire 33 to the Ryan 41 in four plays. 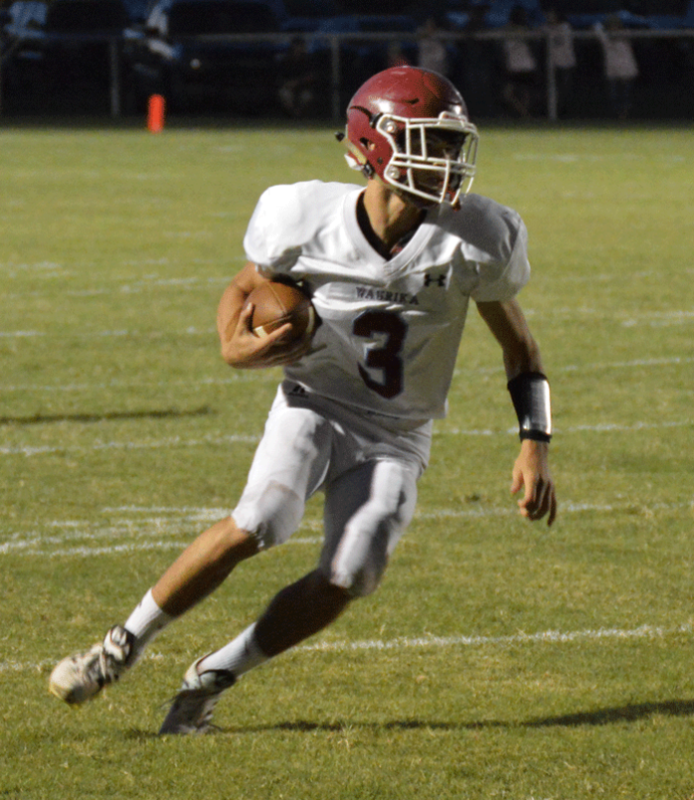 On third-and-six, Monteith found Lucas Contreras on a 41-yard touchdown pass and Daniel Alvarez caught a two-point conversion pass from Montheith to narrow the gap to 48-30 with 5:56 left to play. That would be as close as the Bulldogs would get the rest of the night. On Ryan’s next drive facing fourth and six at its own 49-yard line, the Cowboys pulled off a fake punt by snapping the ball to Parkhill and he broke loose for a 51-yard touchdown run. Fristoe ran for the two points and with 3:48 left in the third quarter, the Cowboys held a 56-30 advantage. The Cowboys really put any hopes of an Empire rally to rest on the Bulldogs’ next drive. Fristoe picked off an errant Bulldog pass in the middle of the field and quickly broke into open field on the left side and went 60 yards for a touchdown. The run failed, but now Ryan led, 62-30, with 2:32 left to play in the third quarter. The Cowboys finally another stop on Empire’s next drive and took the ball over on downs at the Ryan 39. In three plays, the Cowboys were on the scoreboard again. Justin Williams took a short pass from Tomberlin and took off on a 66-yard touchdown pass with 11:53 left in the game. Weldon caught a two-point conversion from Tomberlin to give Ryan a 70-30 lead. Empire did not quit and on the ensuing drive traveled 62 yards on just two plays. Alvarez was on the receiving end of a 33-yard pass by Monteith for the score. Brandon Mendenall caught a conversion pass from Monteith and with 11:41 left to play, Ryan was in front, 70-38. After holding the Bulldogs on the next drive, the Cowboys took over on downs at the Empire 25. It took only two plays with Parkhill carrying the ball to the 10 on first down and then scoring on the next play. Tomberlin ran for the two-point conversion and the Cowboys were comfortably in front, 78-38, with 10:07 left in the game. Empire put together the longest drive of the night moving from its own seven yard line to the Ryan 10 in 12 plays and helped along by a 15-yard penalty on the Cowboys. On second down and goal from the 10, Monteith did not see Parkhill and the Cowboy senior picked the ball off at the one and went from the left side to the middle of the field and finally down the right sideline making a nifty move on the last Bulldog defender to prevent the score and danced into the end zone for a 99-yard touchdown return. That put the Cowboys in front, 84-38, and with 4:48 left in the game the contest ended on the mercy rule. Parkhill had a career night with 238 yards rushing and six rushing touchdowns. He also recorded nine tackles and had the game-ending interception. Weldon had a good night on defense with five tackles, a fumble recovery and an interception. Walter Snider, Fristoe and Tomberlin led the Cowboys in tackles with 13 stops each. COWBOY CORRAL: Ryan now leads the series with Empire, 4-1, but this was the first meeting of eight-man teams….The 84 points scored is the third most in school history behind 97 scored against Devol in 1924 and 92 points scored against Comanche in 1922…The 84 points is the most ever scored by Ryan on the field where the Cowboys currently play breaking the previous high of 80 scored against Pernell in 1985….Parkhill’s interception return is now the longest in school history and broke the record of 94 yards set just last year by Dawson Tomberlin against Bray-Doyle….Because both teams used the onside or short kickoff most of the game much of the contest was played near midfield…Empire’s worst starting field position was its own seven-yard line, but only three drives out of 13 possessions started inside the Bulldog 30-yard line….Ryan had 10 possessions in the game and only three of those started inside the Ryan 40….Parkhill’s 238 yards rushing is the career high for the Cowboy senior and ranks as the 22nd best rushing total in school history….The six rushing touchdowns scored by Parkhill is the second most in school history behind the nine rushing touchdowns by Grant Carter in a 2015 game against Cement….Parkhill scored 48 total points in the contest and that is the second most in school history moving ahead of Nelson Turnbow’s 42 points scored in a 1940 game against Noble, but behind Carter’s total of 54 scored against Cement….Counting return yards and receiving yards, Parkhill finished the game with 351 all-purpose yards….The combined number of points scored – 122 – is the second most in school history behind the 138 points scoring in a 78-60 loss at Grandfield in 1997….The 84 points scored in this game is the fourth most in any game in Oklahoma this season behind Graham-Dustin’s 94 points in Zero Week and Tyrone’s 86 in Week 3 and Destiny Christian’s 86 points in Week 5. Empire: Rushing – Booth 17-89, Jackson Carrio 15-80, Monteith 6-13, Team 1- -16; Passing – Monteith 16-34-259-3; Contreras 0-1-0-0; Receiving – Alvarez 6-103, Mccray Weber 6-65, Contreras 3-77, Booth 1-14. Ryan: Rushing – Parkhill 21-238, Tomberlin 13-106, Travis Fristoe 8-19; Passing – Tomberlin 3-6-79-0; Receiving – Williams 1-66; Parkhill 1-11, Fristoe 1- -2; Tackles – Walter Snider 13, Fristoe 13, Tomberlin 13, Pacen Wiest 12, Parkhill 9, Williams 8, Andrew Villerreal 7, Gunner Phillips 6, Weldon 5, Trey Bryant 4, Sam Brown 2, Raesh Casebolt 1. 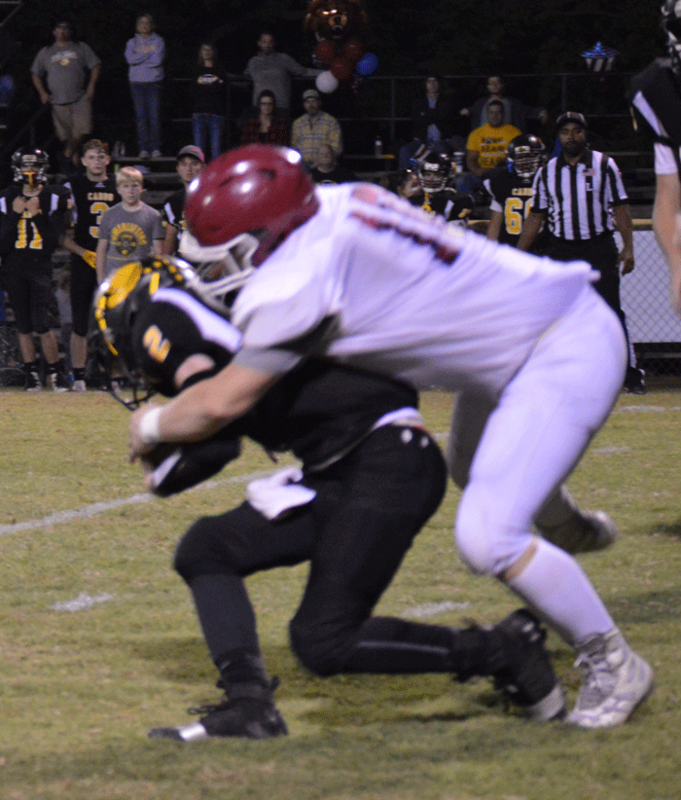 The Waurika Eagles took a big step toward a district title last Friday (October 5th) night as they handed Wilson a 38-6 defeat at Skinny Stewart Stadium in Wilson. Waurika is now 5-0 on the year and faces a match up with rival Ryan Friday night at Cy Sloan Stadium. Kickoff is set for 7:30 p.m. The Eagles do have four more district games remaining and anything can happen, but Wilson came into the game 5-0 and it was widely thought Waurika and Wilson would be the two teams to beat in the district. Using a consistent rushing game Waurika took the opening kickoff and moved 54 yards on just seven plays for the first score of the night. Zachary Brown scored from five yards out and Turner Mora ran for the two-point conversion to give Waurika an 8-0 lead with 9:26 to play in the first quarter. After the two teams exchanged punts, Wilson started a series at their own 45 with just 42 seconds left in the quarter. Trevor Schaff, the Wilson all-purpose senior athlete, rushed for three yards on the first play, but then went 52 yards for a score with just 26 seconds left to play. The quarter ended with Waurika clinging to an 8-6 lead. Waurika answered the Wilson threat with a 51-yard drive for a score. Waurika covered the distance in only four plays. Helped along by a Wilson personal foul penalty Mora capped the drive by covering the final nine yards. Mora ran for the two points and Waurika was in front, 16-6, with 11:40 to go before intermission. Again the two teams exchanged punts, Wilson took possession at their own 20 after Mora’s punt went into the end zone. Colton Bryant advancing down the field. Wilson’s offense sputtered and was hampered by two holding penalties and eventually Waurika forced a punt. But, Waurika turned the ball back over to the home team on their own turnover of the night giving Wilson the ball at the Waurika 40. The Eagles drove to the Waurika 17 but a penalty and a tackle for loss set up fourth down and Wilson could not convert. 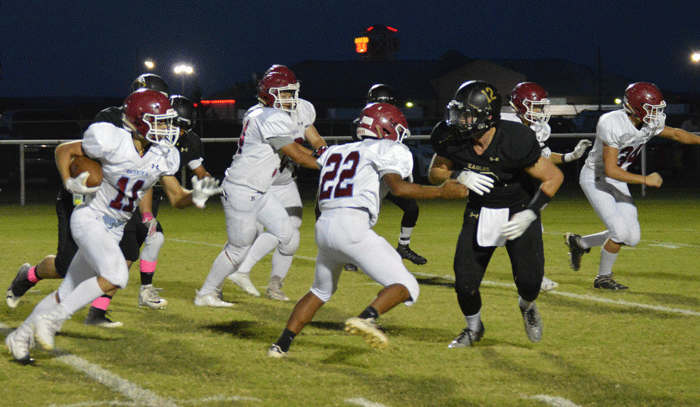 Waurika took over on its own 20 and on the first play from scrimmage Brown swept right and then cut back against the grain into the open field and outran the defenders for an 80-yard touchdown. The run for two points failed, but Waurika was now in front, 22-6, with 2:37 left before intermission. After a Wilson punt, Waurika took over at its own 38-yard line with just over one minute to play. A penalty set the ball back to the 49 and an incomplete pass left Waurika with a second and long. Colton Bryant ran for the first down setting up a last minute score for Waurika. Waurika lined up with everyone to the left and Mora took the snap in an empty backfield and went right and ran 33 yards untouched for the score. Bryant ran for the two-point conversion putting Waurika in front, 30-6, with only 34 seconds left in the half. The second half became a defensive standoff with stagnant offense and penalties. 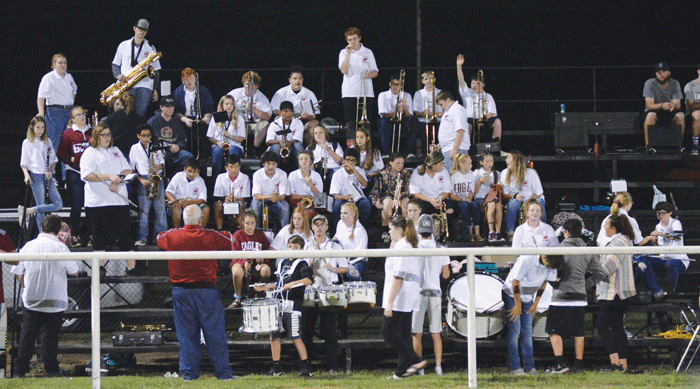 Late in the third quarter Waurika took possession at the Wilson 40-yard line. Overcoming one penalty Waurika moved down the field, but it took 12 plays to get the final score of the night. With 11:52 left in the game, Mora capped the drive with a two-yard run for the score. Mora added the two-point conversion leaving Waurika comfortably in front, 38-6. Neither team could mount a serious threat for the rest of the game. Brown led the Waurika offense with 107 yards on just six carries. Bryant was just behind with 98 yards on 13 carries. Waurika rolled up 295 yards on the ground and that was the entire offensive output on the night for Waurika. Wilson had 317 total yards on the night, but three turnovers and a number of penalties kept Wilson off the scoreboard most of the night. 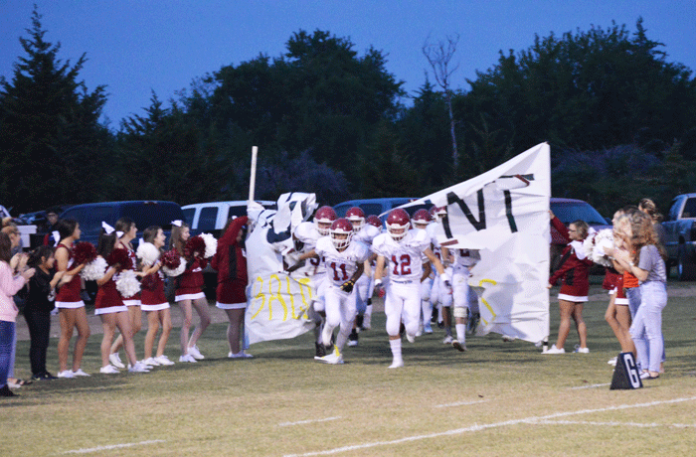 EAGLE FLIGHTS: Waurika now holds a 51-20-3 series edge with Wilson and is 3-0 in meetings since both schools began eight-man play….Waurika has won six of the last seven meetings between the two schools….Waurika holds a 9-6 advantage in the series since the 2000 season….Waurika gained the large advantage in the series with a 13-game winning streak from 1979 to 1991 – the longest of this season…Wilson and Waurika have met a total of 74 times since the first meeting in 1921, which is the second most games against a single opponent in school history….Waurika and Ringling have met 88 times on the gridiron….The 32-point win for Waurika is the largest margin of victory since a 46-7 win in 2010. 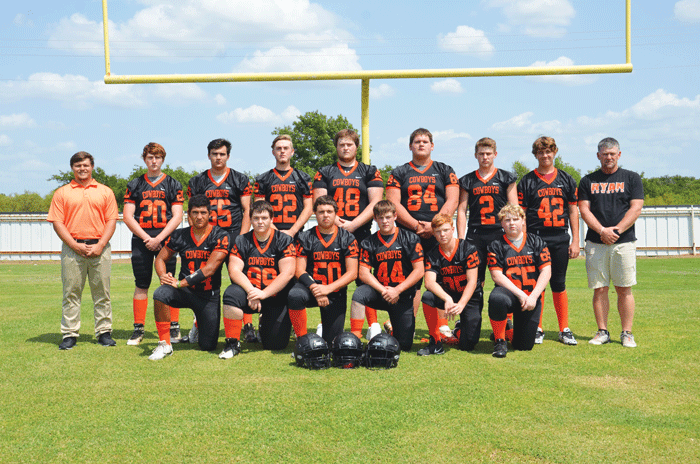 Waurika: Rushing – Brown 6-107, Bryant 13-98, Mora 12-61, Kevin Garcia 5-19, Matt Arriola 1-10; Passing – Mora 0-4-0-0. Not much has to be said or written about the rivalry between Waurika and Ryan. With the two communities just 10 miles apart, it is natural for the two schools to be rivals in all sports competition. The football version of the rivalry is tomorrow night at Waurika’s Cy Sloan Stadium and kickoff is set for 7:30 p.m. In many of the years of this series the two teams have also been competing against each other for district honors and 2018 is no different. 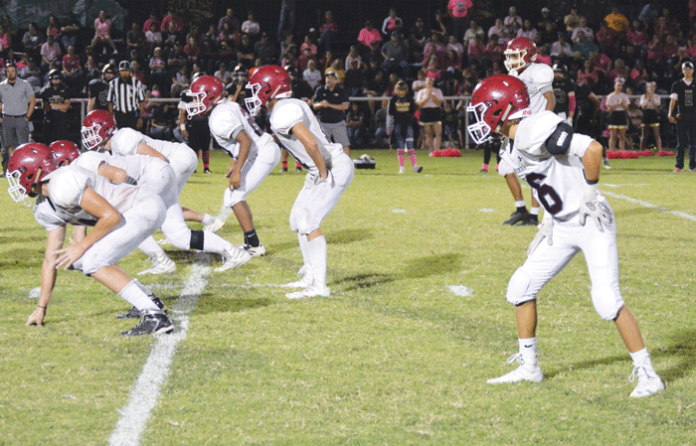 And even though the series in football took a break (except for two seasons) after Ryan moved to eight-man football, the rivalry on the gridiron was resumed in 2012 when Waurika dropped to eight-man football. The series of eight-man meetings have been split at three wins apiece for the two teams. Ryan won the first two and then Waurika won three straight before last year’s thrilling 44-36, double-overtime victory by the Cowboys in 2017. It will be Waurika’s homecoming and that will give the Eagles added incentive to be able to revenge last year’s heart-breaking loss. Waurika has a huge advantage overall in the series that dates back to 1919 – the first year the two schools played football. The Eagles lead the series 40-17-3. 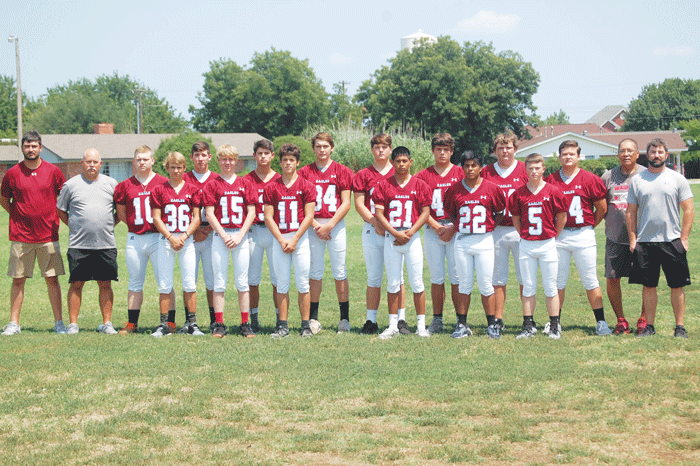 The Eagles built a good part of that advantage with 11 straight wins between 1963 and 1973 before Ryan broke the string in the 1974 season with a 28-0 victory over Waurika on the Eagles’ home field. The game has been close and it has been lopsided. There have been two one-point games between the Cowboys and Eagles – in 1946 and 1954 – and each team came out on top once. Waurika’s largest margin of victory came in a 1971 conquest of the Cowboys as the Eagles whitewashed Ryan, 64-0. In 1937, Ryan earned its largest margin of victory over the Eagles with a 37-0 win. Ryan has twice scored 44 points against Waurika – the highest number of points scored by the Cowboys in the series and both of those games were eight-man contests. Waurika’s greatest margin of victory was the 64-point win in 1971. Two of the three ties in the series were scoreless and they came in back-to-back years in 1942 and 1943. Waurika has 15 shutouts over the Cowboys through the years, while Ryan has seven of shutouts. Both include the two scoreless games. Waurika comes into this year’s game with a 5-0 record, while Ryan is 4-2 on the year. Waurika had its biggest win of the year last week with a 38-6 decision over Wilson. The Cowboys exploded for an 84-38 victory over Empire last Friday night, but that was helped along by two defensive scores and a kickoff return. So, both offenses are potent and it could be an old-fashioned eight-man shootout. Waurika has been a bit more dominating with only last week’s win over Wilson going past halftime. 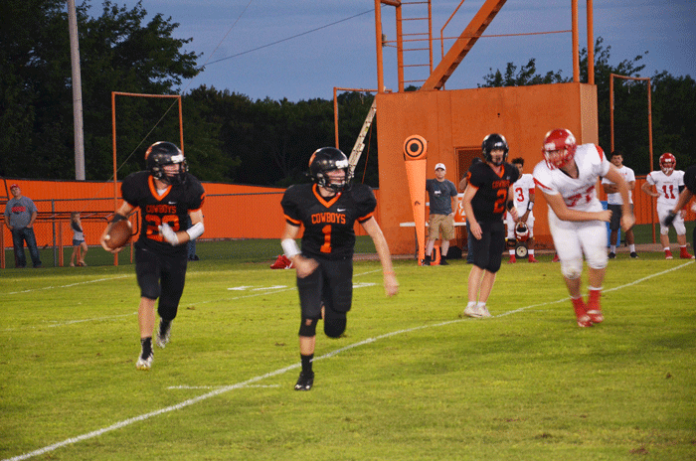 The Cowboys will have to try to corral the team speed of the Eagles and figure out a way to keep the offensive momentum gained against Empire going against Waurika. 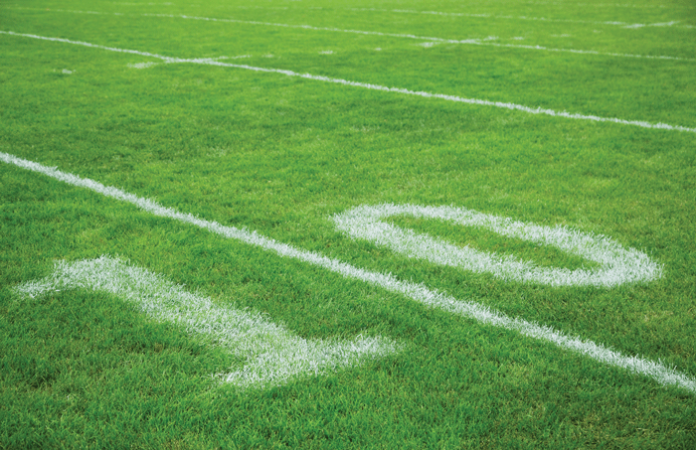 The two schools have three common opponents this season – Temple, Grandfield and Caddo. Both teams had runaway wins over Temple and Grandfield, but Ryan dropped a 57-26 decision to the Bruins, while Waurika rolled to a 48-0 win over Caddo. Waurika features a potent running attack with Turner Mora, Colton Bryant, Kevin Garcia and Zachary Brown. The Cowboys will counter on offense with a more wide-open attack behind quarterback Grayson Tomberlin, who has thrown for over 900 yards this season. He has also rushed for 655 yards. However, the Cowboys are not one-dimensional as Skylar Parkhill has been the favorite target of Tomberlin’s passing attack. The Cowboy senior has rushed for 466 yards and 10 rushing scores. Both teams will be challenged defensively to stop the offensive attacks. Look for a contest with plenty of scoring if Ryan can solve the Waurika defense that has only allowed three touchdowns in five games. 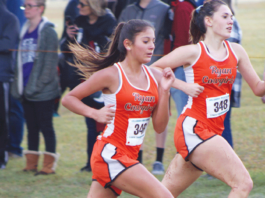 The Ryan Cowgirl cross country squad continues its impressive march through the season as they won two meet titles in two days and claimed a runner-up finish last Monday. Last Friday the fifth-ranked Cowgirls held off Merritt and Waurika to claim the team crown at Frederick. The next day, the Cowgirls added another team title by outlasting Velma-Alma and Waurika and successfully defending the title won in 2017 at Healdton. On Monday, the Cowgirls traveled to Sulphur and finished second to Class 4A’s fifth-ranked Pauls Valley squad. The Lady Panthers had 30 points, while Ryan finished with 64 points. Another impressive feat by the Cowgirls in these three meets in four days is a different runner paced the team in each of the races. 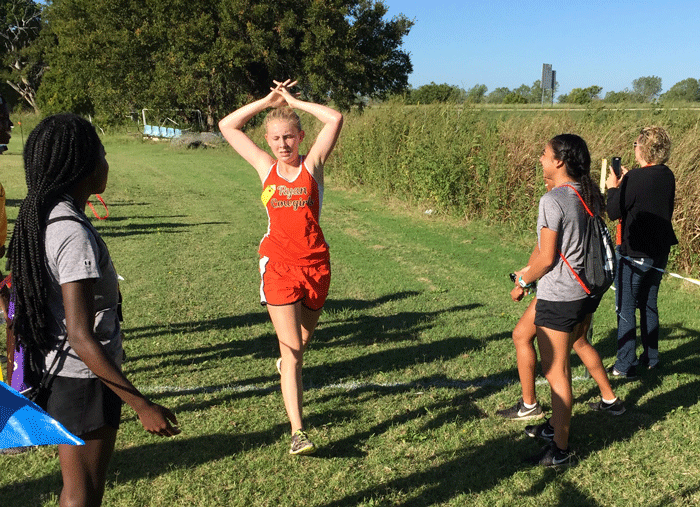 Lilybet Harmon was the top finisher for the Cowgirls at Sulphur. She finished the 2.2-mile course in 15:33.76 and finished seventh overall. The time set a school record for this distance (not many meets run a 2.2-mile course) set a year ago at the same meet by Holland Carter, who ran a 16:18.79 time. Not far behind Harmon was Lily York. She finished 10th with a time of 15:52.40. Juliet Spangler was 12th in the race with a time of 15:58.18 and Carter was 16th with a time of 16:22.49. Katelyn Dabbs recorded a 26th-place finish and a time of 17:38.15. Alicen Williams finished 41st in the race that featured 64 runners. Last Saturday at Healdton it was Spangler leading the way for the Cowgirls on the 3,200-meter course in claiming the team title. Spangler finished third in the individual race and Harmon was right behind in fourth place. Carter was sixth, Dabbs finished seventh and York was eighth giving the Cowgirls four top 10 finishers. Williams rounded out the Cowgirl competitors by finishing just one spot from earning a medal as she recorded a 26th-place finish. Times were not available for the meet at Frederick or Saturday’s competition at Healdton. At Healdton it was Dabbs, a freshman, claiming her best finish of the season. Dabbs nabbed fifth place in the race and Harmon and Spangler were right behind at sixth and seventh place, respectively. York finished in 10th place, while Carter came in 12th place. Williams finished 30th in the competition. 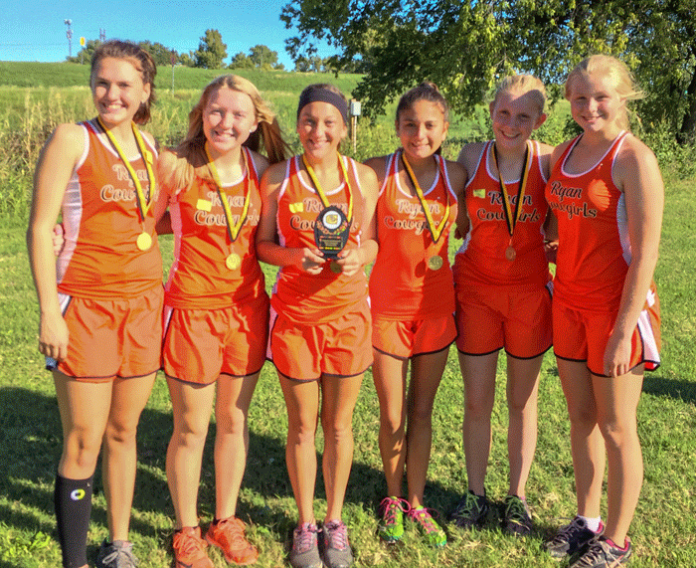 Sixth place in a team race is not normally considered a very impressive finish, but for the Ryan Cowgirls’ sixth-place finish at Velma-Alma’s cross country meet a week ago Tuesday was quite a performance. The five teams that finished in front of the Cowgirls were all Class 4A teams and all of them are ranked among the top 11 in that class in the state. It was an extremely competitive meet in the high school girls’ division with 23 teams and over 200 runners entered in the meet. Ryan finished with 202 points, which was well behind Ardmore Plainview’s meet-winning total of 49 points. Tuttle finished fifth ahead of the Cowgirls with 156 points. Another indication the meet was a tough one was despite the sixth-place team finish, none of the Cowgirls earned a medal by finishing in the top 25. Spangler led the Cowgirls’ effort and finished just out of earning a medal with a 26th-place showing. She finished with a time of 14:01. Not far behind was Dabbs who managed to finish 35th with a time of 14:22. Harmon was just two seconds behind Dabbs and finished 36th. Carter was 46th with a time of 14:43 and York was 59th with a time of 15:00. Alicen Williams also competed for the Cowgirls, but her finish did not count in the team total. Williams was 100th with a time of 16:41. The finish by the Cowgirls was also impressive because two of the girls had been battling illness just the day before the meet. The Cowgirls will next compete in the Cameron University meet at the Big Green Soccer Complex in Lawton. This will be the final meet of the year until the Class 2A regional on October 13. 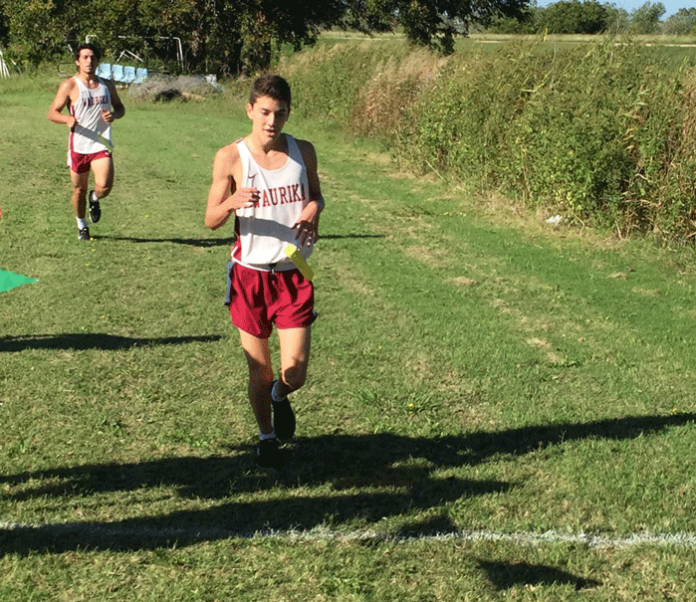 The junior high boys’ team competed in the meets at Sulphur, Healdton and Frederick. The Cowboys recorded a fifth-place team finish at Sulphur and earned runner up honors at Healdton. GIRLS: 6. 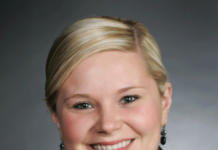 Jasmine Villarreal, 31. Whittany Spangler. BOYS: Mason Adsit, Alex Urbie, Carson Williams, Tommy Self, Aidan Urbie. It is time for serious football for the Ryan Cowboys. District B-4 contest at Bob Givens Sports Complex. The Cowboys will take a 3-2 record into the game with the Bulldogs, while Empire is 2-3 on the year. Ryan enjoyed a bye week last week and no doubt first-year head coach Tony Tomberlin helped identify the areas the Cowboys have struggled this year during the extra practice sessions. The break also gave the Cowboys opportunity to head from nagging mid-season injuries. This will be the first meeting between Ryan and Empire on the gridiron since 1977 when Ryan last played 11-man football. Empire dropped to eight-man football last season and made a playoff appearance in its first year. The Bulldogs were the pre-season favorite in most polls to win the district title. It is a long drive to Caddo. But the Waurika Eagles made quick work of the contest with the Bruins in coming away with a 48-0 victory last Friday night. The Eagles move to 4-0 on the year and have not played past halftime in any of the games. Team Captains (l-r) Colton Bryant, Aaron Nitka, and Austin Dyer. Waurika will move into district play Friday night as they travel to Wilson to face the Carter County Eagles. Kickoff is set for 7:30 p.m. 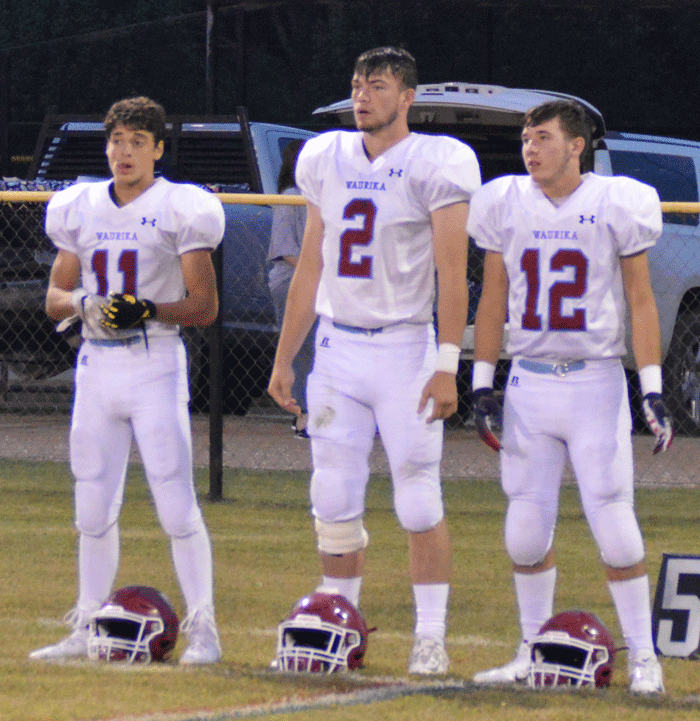 The defense came up big for the Eagles last Friday night at Caddo. 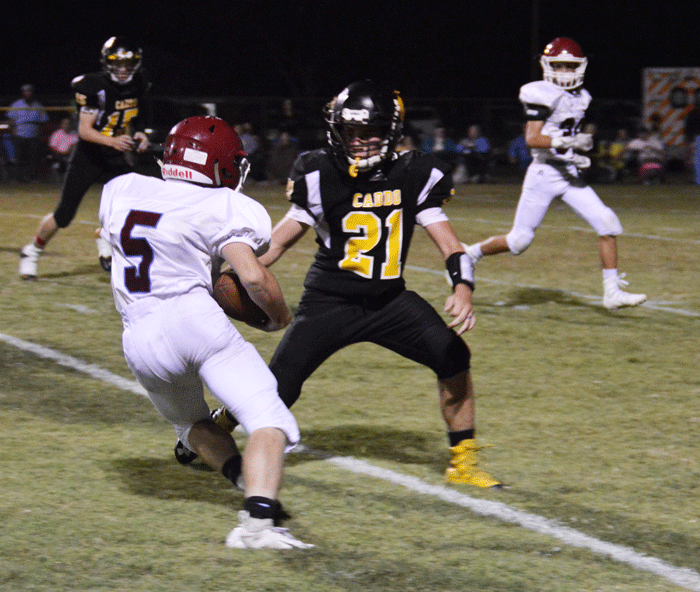 Waurika took advantage of four Caddo turnovers – turning two of them into instant scores – and also blocked a punt that set up another score for Waurika. 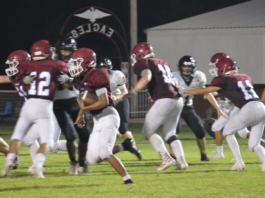 That effort coupled with Waurika scoring three touchdowns in less than two minutes of clock time propelled the Eagles to the big victory and aided in taking command of the game midway through the first quarter. The Eagles got on the scoreboard with 8:18 left in the first quarter that set off the flurry of scores. Colton Bryant carried the pigskin in from 15 yards out and also ran for the two-point conversion to give Waurika an 8-0 edge. Zachary Brown alluding a defender. 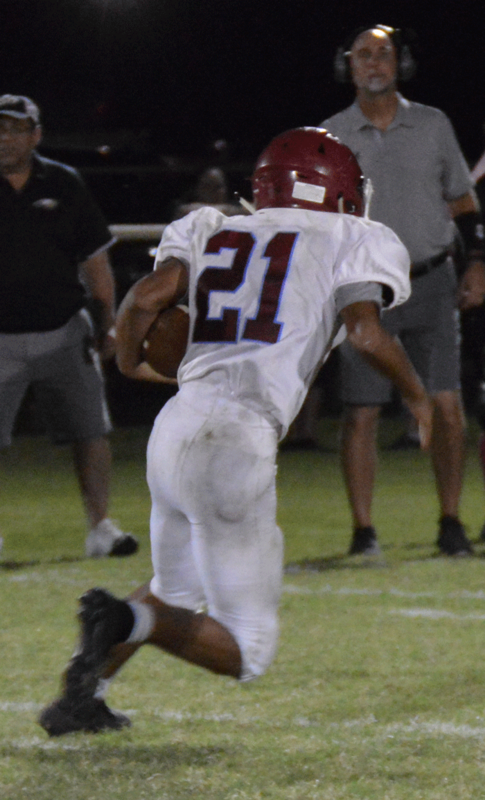 Caddo was mounting a drive to answer the score, but fumbled the ball at the Eagle 45 and Edwin Garcia alertly scooped it up and returned it 55 yards for a touchdown. Kevin Garcia ran for the two points and Waurika held a 16-0 lead with 7:04 to play in the half. The next Caddo possession also ended in a turnover and the Eagles took advantage. Austin Dyer hauled in a 22-yard pass form Turner Mora and Mora ran for the two points and what had been a 0-0 deadlock just moments earlier was now a 24-0 Waurika advantage. 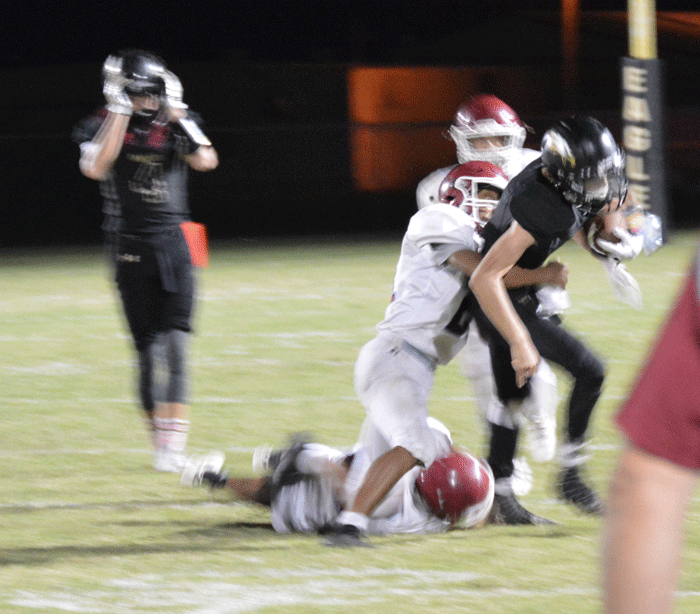 The Eagles got another break late in the first quarter as the Bruins were pinned deep in their own territory and fumbled the ball. E. Garcia once again was in the right spot and picked up the loose ball and carried it 10 yards for a touchdown. Mora ran for the two-points and with 52 seconds to play in the first quarter, Waurika led, 32-0. Midway through the second quarter, Bryant got his second score of the night on an eight-yard run. Zachary Brown ran for the two points and Waurika was in front, 40-0, with 7:21 to play before intermission. Waurika closed out the scoring with Mora’s 23-yard scoring scamper and Matt Arriola tacked on the two-point conversion to put Waurika in front, 48-0, with 2:18 left until halftime. Caddo could not answer and the game ended at the half on the 45-point mercy rule. For the second time this season Mora led the Eagles in rushing with 73 yards on just six carries. Bryant tacked on 66 yards on nine carries and two scores. EAGLE FLIGHTS: Waurika now leads the short series with Caddo, 3-2…..The 48 points score by Waurika is the most ever against Caddo and the 48-point margin of victory is also the most ever in the series…Waurika broke a two-game losing streak to the Bruins with the win…Waurika got its first eight-man victory over Caddo after two losses….The Eagles and Bruins played a two-game series in the late 80’s with Waurika winning both games handily…All three of Waurika’s wins over Caddo have been shutouts….Waurika has not started a season 4-0 since the 1989 season when the Eagles won their first nine games and carved out a 12-2 mark for the season…Despite the 4-0 start, the Eagles are not getting much respect around the state as they are unranked in every notable poll. Waurika: Rushing – Mora 6-73, Bryant 9-66, Brown 2-23, Arriola 4-17, K. Garcia 3-10, Dyer 1-1; Passing – Mora 2-7-0-25; Receiving – Dyer 1-22, Bryant 1-3. It was a busy week last week for the Waurika cross country squads and the Waurika boys came away with two runner-up finishes at Frederick and Healdton. At the Frederick Invitational last Thursday, the Eagles had only two runners earn medals, but that was good enough for a team finish of second place. Cache Arellano was 15th to top the Eagle runners, while Bryson Hernandez was the only other medal winner with a 20th-place finish. Other results for the team were not available. At Healdton last Saturday, the Eagles also managed a second place team finish, but this time all six Waurika competitors finished with a medal. Hernandez topped the Eagle entries with a second-place finish. Three Eagles finished in successive order including Arellano who was eighth, Kevin Garcia who was ninth and Gustavo Gomez who was 10th. Edwin Garcia finished 18th and Nicolas Alvarado was 19th to round out the Eagle medal winners in the meet. The Lady Eagles finished third at Frederick. The 12th-ranked Lady Eagles were behind seventh-ranked Merritt and meet champion Ryan, who is ranked fifth in Class 2A. Asia Smith turned in an impressive performance at Frederick and came across the finish line in first place. Lexie Streeter was fifth and Tallin Mora finished 17th to round out the medal winners for the Lady Eagles. The Lady Eagles also earned a third-place finish at the Healdton Invitational. The Lady Eagles were just behind Velma-Alma and team champion Ryan. Smith was again the leader for the Lady Eagles as she finished second in the individual race. Streeter was third and Mora captured 15th place. Times for the performances at Frederick and Healdton were not available. At Healdton, the Waurika junior high girls’ team captured the team title. 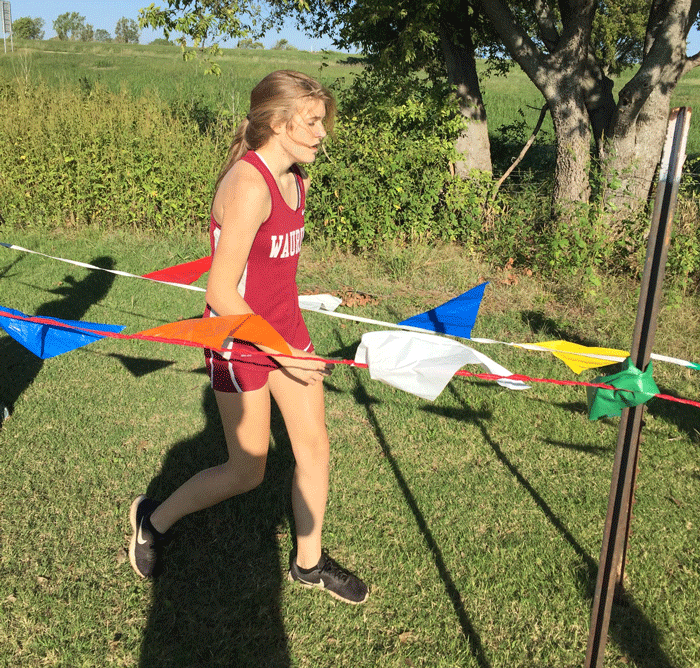 Waurika’s cross country teams competed a week ago Tuesday in the crowded field at the Velma-Alma Invitational. The Eagles finished ninth in the team race, but none of the Waurika competitors finished in the top 25 to earn a medal. Waurika had 330 points and team champion Byng finished with 34 points. Only one Class 2A team finished ahead of the Eagles. Leading the way for the Eagles was Bryson Hernandez, who finished 28th. His time of 19:13 was a season-best for the junior multi-sport athlete. Arellano finished 50th with a time of 20:04 – nearly a minute better than his fastest time of the season. Rounding out the Eagle competitors were K. Garcia (64th, 20:40), Octavio Gomez (66th, 20:45), G. Gomez (89th, 21:43), E. Garcia (101st, 22:23) and Alvarado (116th, 23:08). The Lady Eagles managed to earn 11th place in the 23-team field at V-A. Waurika finished with 371 points well behind Ardmore Plainview that finished with 49 points. However, only two Class 2A schools – Ryan and Velma-Alma – finished ahead of the Lady Eagles. Streeter was the top competitor for the Lady Eagles finishing 27th with a time of 14:03 – her best time of the season. Mora was 54th with a time of 14:56, while Dallas Fristoe finished 88th with a time of 16:18. Faith Roberson was 92nd with a time of 16:28 and Kaci Reynolds rounded out the team finishers with a 110th-place finish. Also competing for the Lady Eagles was Hope Cummings, who finished 114th with a time of 17:17. Over 200 girls competed in the meet. These three meets closed out the regular season for Waurika’s cross country teams. The next action for Waurika will be the Class 2A Regional Cross Country meet on October 13. Waurika finished third in the team race with 142 points. 10. Aubrey Showalter, 11:21; 25. Kynlee Waters, 11:58; 31. Jaci Gholson, 12:07; 34. Skylar Garrett, 12:14; 42. Liberti Simmons, 12:34; 48. Trish Julian, 12:50. 43. Isaac Camarillo, 14:54; 48. Alex Gomez, 15:00.